With up to 21 km of ski slopes, Matterhorn glacier paradise offers the world’s largest summer snow sports region. 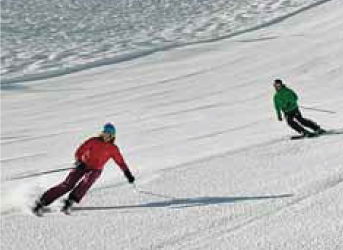 Enjoy the summer on endless pistes with a spectacular backdrop of mountains. You never skied before? No problem! We’ll provide you with all equipment needed for skiing. Under the guidance of our preferred ski school, you will make your first skiing experience in the morning and for sure have heaps of fun. After your group lesson, you’ll recharge your batteries with a delicious menue at the newly renovated restaurant and enjoy the various peak attractions of Matterhorn glacier paradise. Peak attractions like panoramic platform, cinema lounge, snow tubing and glacier palace.